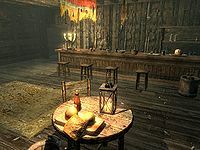 New Gnisis Cornerclub is a tavern in Windhelm. It is located in the Gray Quarter, next to Sadri's Used Wares. The tavern is run by Ambarys Rendar and his employee, Malthyr Elenil. Ambarys tends the counter while Malthyr cleans the taproom (he was supposed to take over the club if Ambarys dies, but doesn't, due to a bug). It consists of one area only, New Gnisis Cornerclub. NOTE: Like all other stores, New Gnisis Cornerclub has a number of fixed wares on display scattered around the main trading room. These can be bought from the proprietors and will disappear from the room when purchased. For a list of these special items, see this section. * Depending on choices made during the Diplomatic Immunity quest. Find the Thalmor Assassin: The Thalmor are after Malborn. Help him get to safety. The ground floor consists of the taproom, which is quite messy and worn-out. 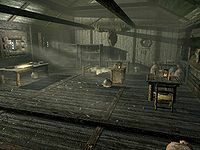 The front door opens to the sight of the bar, which seats four and has a sweet roll, a wedge of eidar cheese, a bottle of alto wine, two loaves of bread, a bottle of Nord mead, a boiled creme treat, a salt pile, and a potion of minor healing on display. Hidden behind the bar is some bone meal. The shelves contain a bottle of Nord mead, two red apples, and a bottle of wine. The only table for customers contains a goat cheese wedge, a green apple, and a bottle of Nord mead. To the north is the staircase leading to the second floor and, hidden underneath the stairs, sits the Sneak skill book The Red Kitchen Reader. 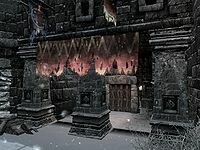 The second floor is filled with evidence that Windhelm was once under Imperial control. Banners hangs from the ceiling and an Imperial sword with matching shield, armor, bracers, helmet, and boots can be found along the southern wall. The single table for customers holds a loaf of bread, a boiled cream treat, and a bottle of alto wine. The dresser holds lower-class clothing and has a salt pile and the Alchemy skill book A Game at Dinner on top. The wardrobe contains more clothes and the barrel contains food. The shelves hold a bottle of alto wine, a copy of The Firsthold Revolt and the tavern's strongbox. 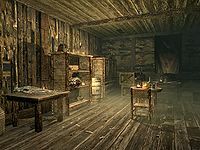 Hidden underneath the stairs to the third floor is a rare bottle of double-distilled skooma, related to the quest Some Light Theft. The top floor contains the owned bed where Malthyr Elenil sleeps between midnight and 8am. There is also an empty pot and two large food sacks scattered on the floor. The table along the western wall contains the business ledger, a copy of The Arcturian Heresy, and a slice of bread. The two sets of shelves in the northwestern corner only contain a sliced goat cheese, a bottle of Nord mead, and some leather strips. A pair of shoes is on the floor behind the bed, at the bottom of a dresser with clothes, which has a set of fixed clothes on top, along with twelve gold coins. At the foot of the table in the northeastern corner are three food sacks while the table itself holds a hunting bow, a pickaxe, and another food sack. Lastly is a table with a potion of healing on top. The following items are sitting out in the store on counters, shelves, or tables. They can be purchased or taken for free if your disposition with Ambarys Rendar is high enough. They respawn after ten days. This is the merchandise found in the cornerclub's merchant chest. These items are only available if purchased from the merchant; they cannot be pickpocketed or stolen. They are restocked every two days. "You didn't hear it from me, but if you want a real drink, head down to the New Gnisis Cornerclub, in the Gray Quarter." "The Dark Elves run the New Gnisis Cornerclub. Why they can't just call it a tavern is beyond me." Malthyr is supposed to take over running the New Gnisis Cornerclub if Ambarys dies. Although he stands behind the bar as if he is running it, he does not offer any services. This page was last modified on 24 May 2018, at 07:37.